The immense pressure on healthcare services has been highly publicised. One of many key statistics to indicate this, is that whereas the proportion of over 65s in the UK population rose only marginally between 2000 to 2010, from 23% to 24%, by 2035 it is expected to increase to 44%. This will bring about quite different pressures on the NHS, notably in how they deal with patients with long-term conditions and mental health conditions. The cost of providing long-term care is as yet untold. An ageing population increases healthcare costs and is a significant contributor to the funding gap, which currently stands at approximately £20 billion per annum and is expected to increase to £30 billion by 2021. As a consequence, there needs to be significant change as to how healthcare services are procured, commissioned and delivered. There has been much talk of how acute services are to be transferred to the community, however we currently have the wrong healthcare infrastructure (i.e. property) to enable a major shift of services in order to facilitate the right healthcare service models to meet the needs of demographic change. Since 2015 there have been funding initiatives to help improve healthcare real estate, notably the Primary Care Infrastructure Fund announced in 2015/2016 that will provide £1 billion over a four-year period. Latterly, however, this has evolved into the Estates & Technology Transformation Fund which reduced the funding to £900 million including Information Technology. This is the extent of funding for new infrastructure until 2019. The period beyond 2019 needs to be considered in context of the NHS Forward View (October 2014) and GP Forward View (April 2016). These documents provide direction and insight about the significant changes in how healthcare services are to be provided, as well as the structure of healthcare. There is much activity by way of mergers of GP practices, the emergence of super practices (50,000+ patients) together with vanguards and multi-speciality community services (MCPs), so it is likely that there will be much change in healthcare services from 2020 onwards. – How are you going to prevent ill health and moderate demand for healthcare? – How are you engaging patients, communities and NHS staff? – How will you support, invest in and improve General Practice? – How will you implement new care models and address local challenges? – How will you achieve and maintain performance against core standards? – How will you achieve our 2020 ambitions of key clinical priorities? – How will you improve quality and safety? – How will deploy technology to accelerate change? – How you will develop the workforce you need to deliver? – How will you achieve and maintain financial balance? It is this final objective that I consider to be the most significant, together with the reference to the year 2020. With the new infrastructure being delivered under the ETTF needing to be on stream by 31 March 2019, I think the exciting time is going to be thereafter, which will coincide with both CCGs becoming more established and with the emergence of super practices. Where this will leave the funding for premises is open to conjecture. My thoughts are that we are likely to see less reliance on the payment of notional rent to practices, with premises thereafter being funded through payments per capita and incentives to provide a greater range of services. This in turn is likely to lead to remodelling of how healthcare practices are funded. 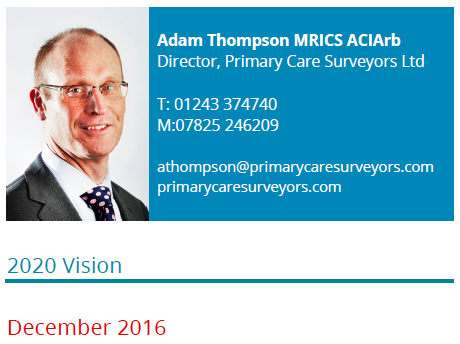 Currently there are a significant number of mergers of practices within primary care. This largely seems to be about consolidation of patient numbers. The cost of operating any business is largely driven by the number of locations and many of these mergers have seen the continuing provision of services from small inadequate premises. I expect these practices, in time to come, to be seeking to reduce the number of locations they provide services from, which will then see a shift towards fewer but much larger premises from which a greater range of services can be provided, including out of hours, minor injuries and diagnostic services. The consolidation of primary care services into fewer locations may result in some rural areas being without a doctors’ surgery. This may provide opportunities for community pharmacy to step up and provide a greater range of services. It may be that consulting rooms within pharmacies become more substantial than the current ‘booth’ and become suitable for a GP or nurse to be based in the pharmacy for some sessions. Certainly there will need to be change in thinking as to how healthcare is to be provided to meet the needs of an ageing and more demanding population. There will also need to be collaboration between various healthcare providers, and ultimately there will also need to be greater investment in infrastructure to ensure we have the right facilities to meet the changing needs of the healthcare service providers and patients.